Cherry Mobile recently announced on its Facebook page that it will offer a new mobile phone that is exclusively to Lazada. The cheapest octa-core phone is called Cherry Mobile Me Vibe, which will be available on January 9, 2015. 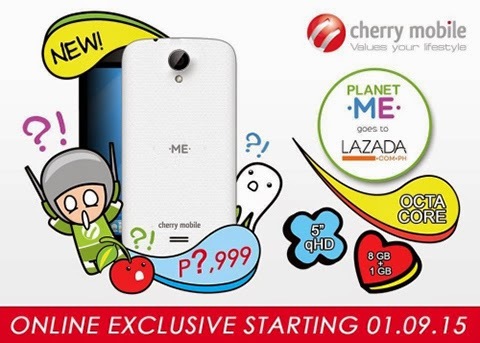 The Cherry Mobile Me Vibe is equipped with Octa Core processor and runs on Android 4.4.2 operating system. It sports with 5-inch IPS LCD Display paired with 13MP back camera and 2MP front camera. It has also 1GB RAM and 8GB Internal storage, which expandable up to 32GB via microSD. The new device is Dual-SIM, Dual-Standby and WIFI capable.